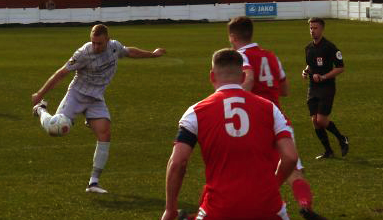 Defender Louis Laing was delighted to net his first goal for the club in Saturday’s 3-0 win away at Ashton United. The former Hartlepool United man lashed home a half volley from 15 yards out – picking out the top corner. “The whole team deserves credit this afternoon,” insisted Laing, “can’t fault anyone out there this afternoon, lots of intensity from the lads. “I had to pluck it down from the air and the strike was just a bit of finesse. “He was a bit rusty when he came back but his performance today was just unbelievable. The Spartans boss now has a plethora of options at the back, with Jordan Watson waiting in the wings along with Ryan Hutchinson – who is set to feature for the reserves mid-week. But Laing and Buddle currently hold the shirts – and their after their performances against Ashton, they are willing to give them up without a fight.